Business deluxe. Sony focuses on its strengths and installs a first rate (matt) Full HD screen. 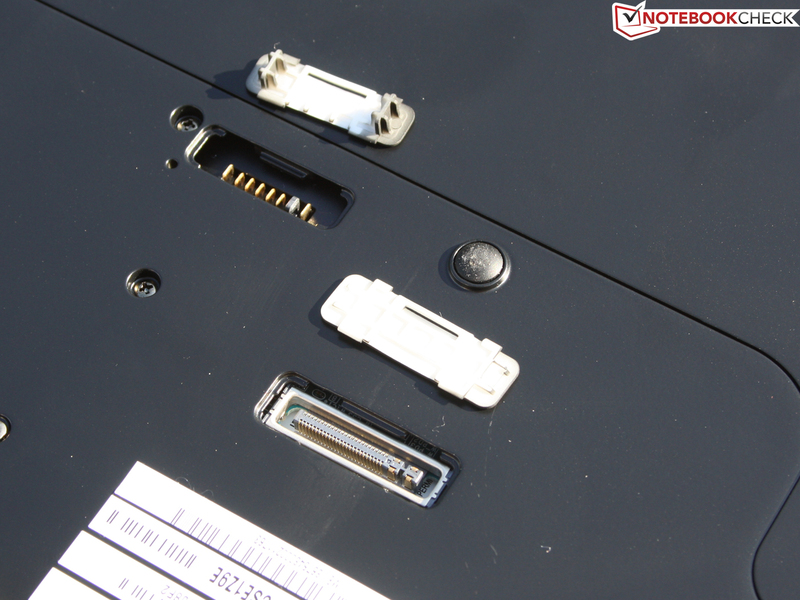 There is also a gaming capable graphics and pro features, such as docking port, UMTS and battery slice. The perfect fusion of work and entertainment? Sony Vaio VPC-SE1Z9E/B: Luxury business with all gimmicks? Sony ventured into the business field with the Vaio SB range (13.3 inch) in the spring of 2011 (docking port, 3G, matt TFT, etc.). 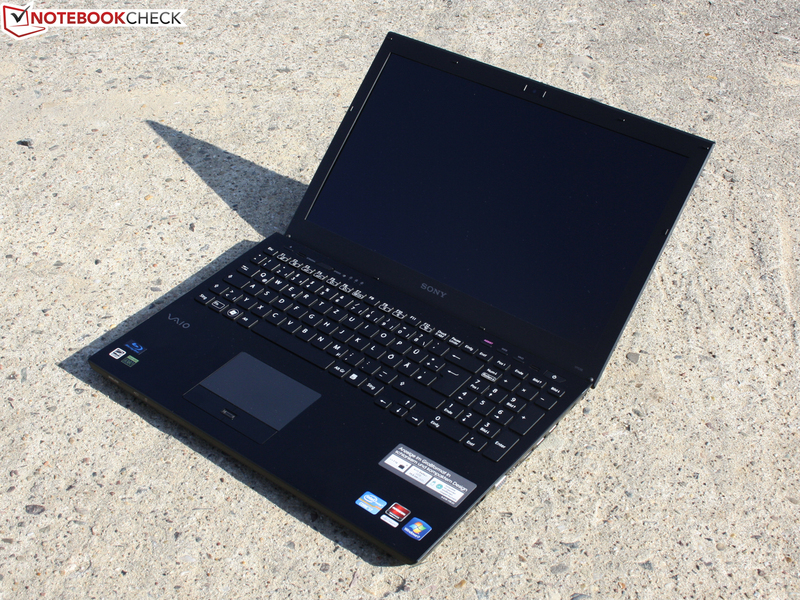 The Vaio SB1Z9EB (upgrade: SB2L1E/W) was basically a coherent business bundle, but messed up in the rating with its color and viewing angle weak screen, as well as high system noise during CPU load. Will things now get better? The 15.5 inch laptop with the same looks and features (docking, etc.) brings a Vaio Plus screen with a Full HD resolution into play. If the system noise is now also all right, the 13.3 inch SB would therewith be straightened. So much will be revealed: There is an improvement. Find out why it's still not enough for a "Very Good" in the final rating in our comprehensive review of the Vaio VPC-SE1Z9E/B. Black or silver. Sony sells the low-priced (silver) and the higher priced (black, test device) versions of its Vaio SE model in these colors. The matt surfaces are good to handle, but not too dull. 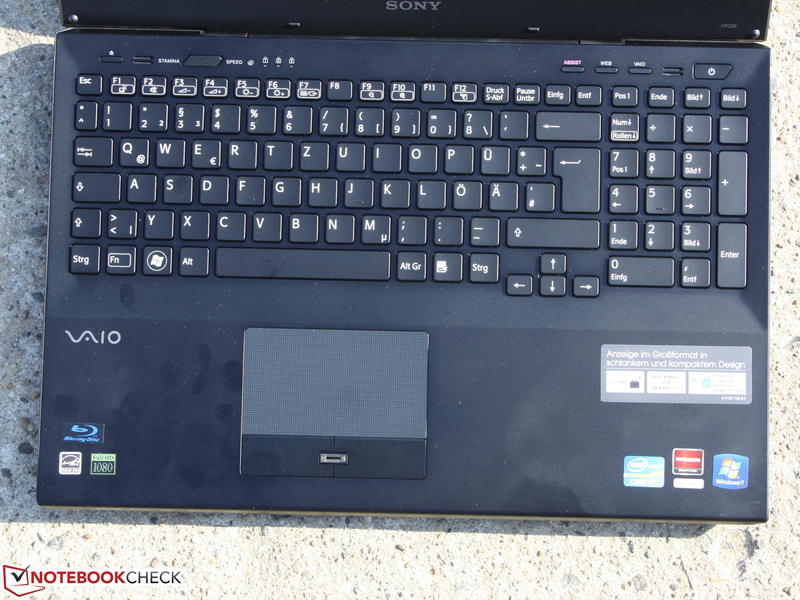 Fingerprints only play a secondary role in the life of this Vaio. They are barely visible. The case is made of a combination of plastic (interior, display bezel) and light magnesium (lid, base tray). Thus, the Vaio SE is very light for a 15.5 inch device: 2033 grams. Typical for a 15.6 inch unit would be 2.5 kilograms. The black plastic insides are fairly slip-proof and bid a lot of room for resting the hands. The wrist rest fits absolutely tight but we can depress the key field with moderate pressure to an extent. 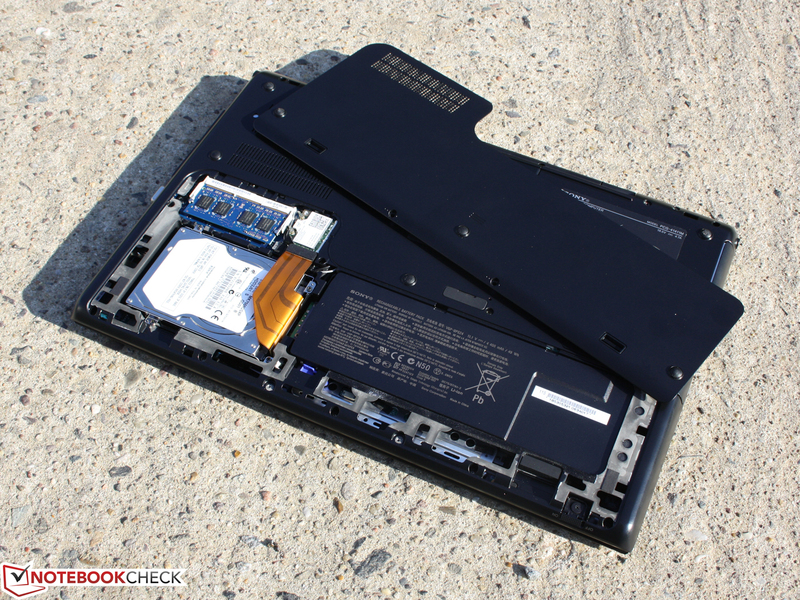 The Vaio SE doesn't have a perfectly stiff base unit. 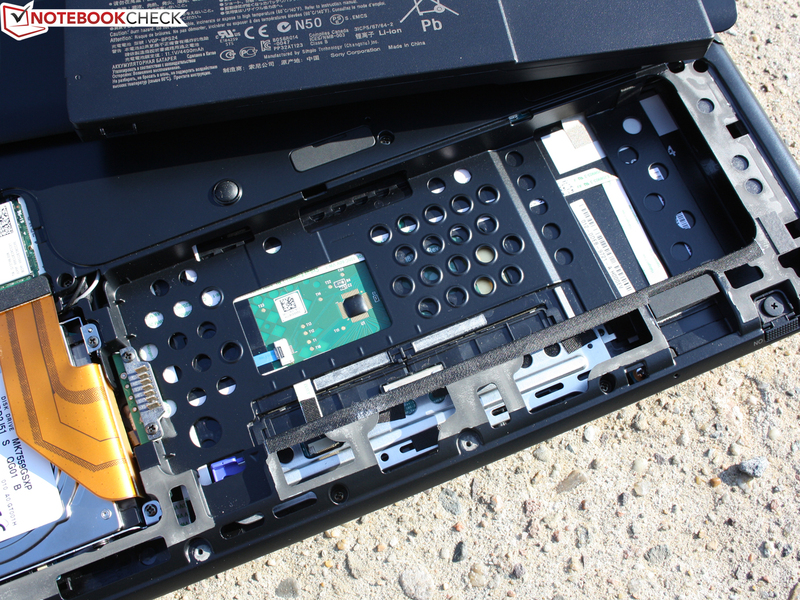 The area around the optical drive has a good stability. But we can twist the whole chassis with both hands to a certain degree. This also applies to the lid. Its hinge isn't pulled tight and the lid is kept very unstably in place. The stop at the maximum opening angle is soft (about 140 degrees) and the hinge jerks creakingly at its stop at this moment. The lid's hard magnesium surface prevents stronger yielding, but the diameter of 15.5 inches is too much for it. The teetering lid is the hinge's biggest shortcoming (e.g. bumpy road trips by car). The lid is contrasted with a narrow plastic strip in the front area. It can prevent the unsightly wear of the painted magnesium surface. The big maintenance cover on the bottom leads to the hard disk, WLAN module, RAM (1 socket) and battery. The latter can also be removed for permanent desktop use. The matt surface doesn't completely prevent fingerprints. A base plate leads to the HDD, WLAN and RAM. The magnesium alloy ensures a low weight, but the rigidity is only satisfactory. 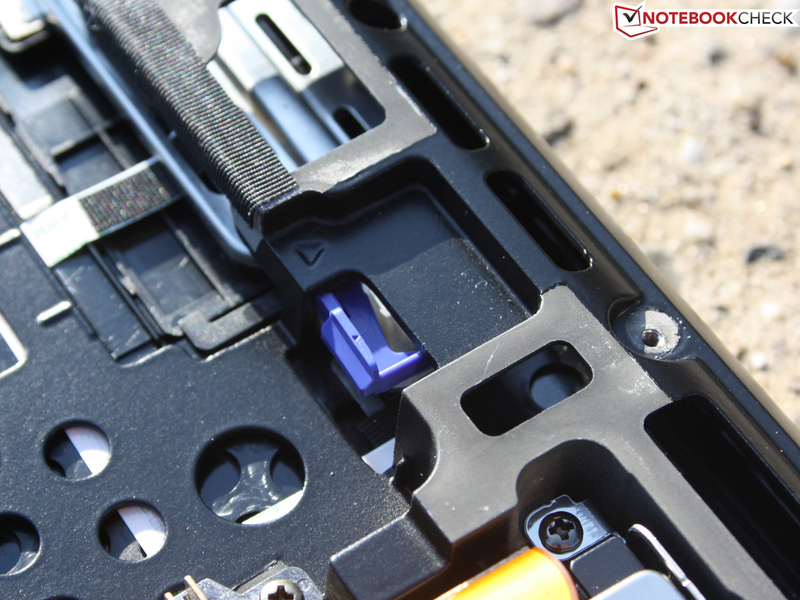 The internal battery can be removed easily. 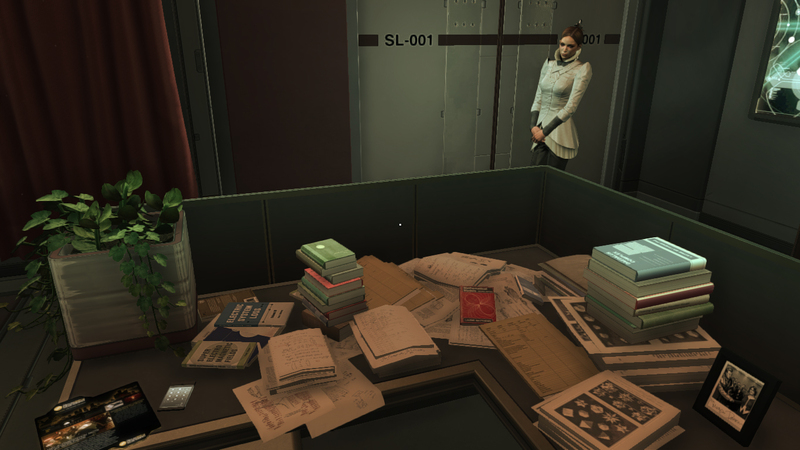 Almost all interfaces are concentrated on the case's right. 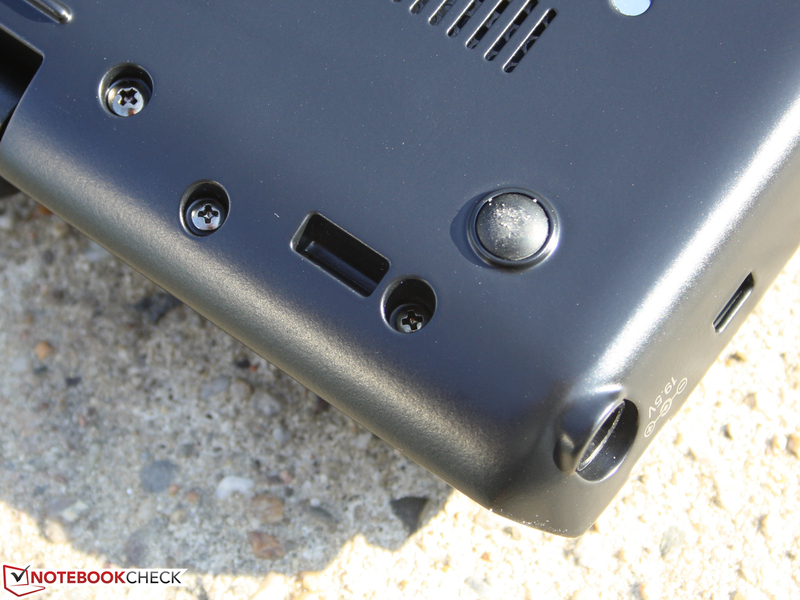 The front and rear don't supply any ports and only the headphone out is found on the left. In return, three USB ports (among them 1 USB 3.0), VGA, HDMI and Ethernet are gathered on the right. 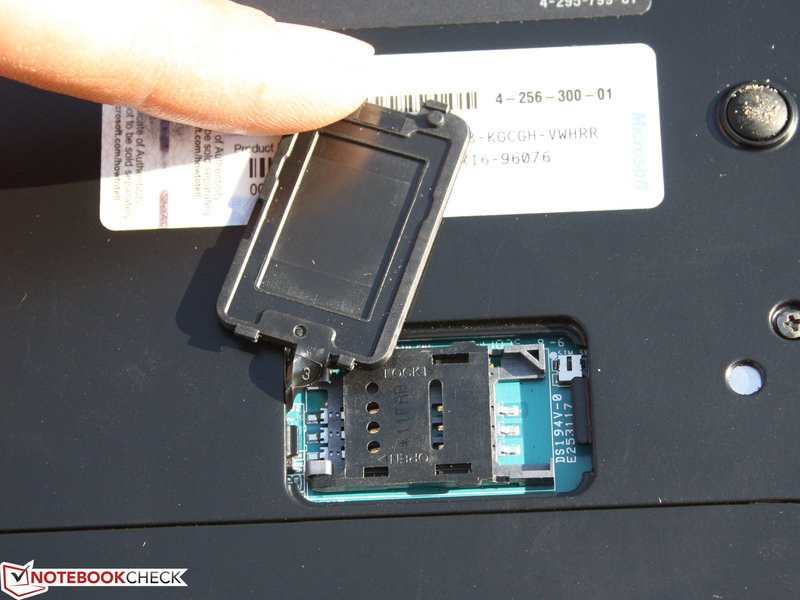 The duo card reader, for a memory stick and for SD cards, is standard in almost all Vaio notebooks. 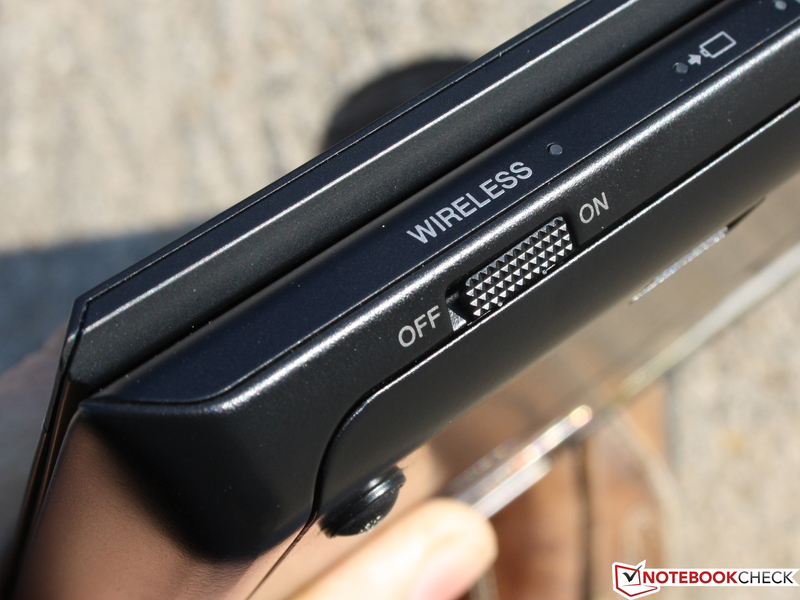 In our opinion, the interface positioning is good because it allows the cables to be led neatly to the right rear. The left side of the table is spared from a cable mess. This isn't optimal for right handed users. However, the docking station mentioned in the following can completely keep the cable chaos away from the device. Wireless communication is comprehensive and up to date: Gigabit LAN, draft-n WLAN, Bluetooth 3.0 and to finish a Qualcomm Gobi 3000 HSDPA module. Thus, everything needed for stationary and mobile Internet access is installed. The provider's SIM card is inserted on the case's bottom. The slot is found underneath a hard rubber cap. The 3G option is only available in the expensive, black Vaio SE version. The webcam has a resolution of 1.3 megapixels according to the standard. Videos can be recorded with up to 1280x1024 pixels (1.3 MP). The next higher resolution, 2560x2048 pixels (5.0 megapixels) is interpolated via an Exmor chip and can only be used for pictures (sample picture in original resolution). The result in good light on the object is impressive. Videos don't create intense streaks even in poor light. 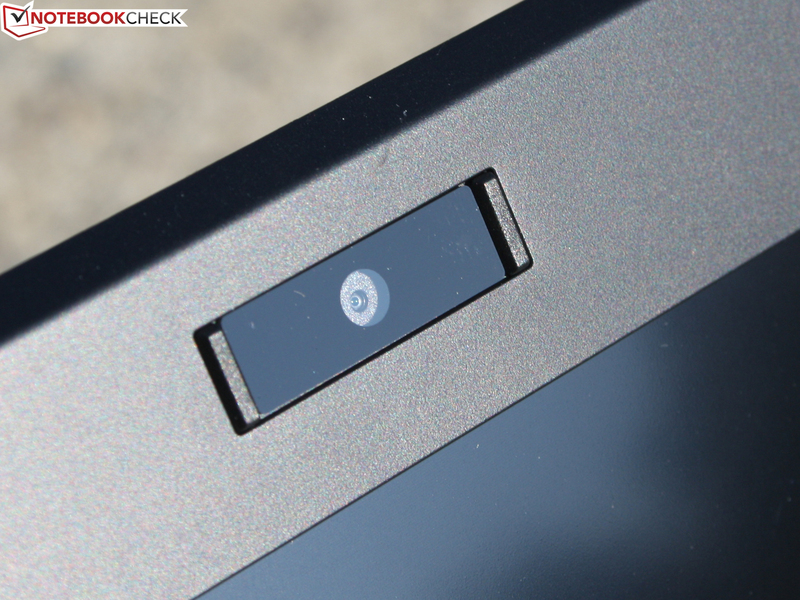 This shows us a higher quality, more light-sensitive webcam than found in most other laptops. Passwords can be saved in the safe via the fingerprint reader and replaced through a fingerprint. The Kensington lock, for connecting the according steel cable, has been standard for a long time already. Interesting for corporate customers with an IT infrastructure: The Trusted Platform Module (TPM) according to TCG 1.2 specifications is the latest version (computer identification by cryptographic key). The docking solution, VGP PRS25 (about 150€), matching to the SE-series is available in retail (SB series: PRS20). It has the same power adapter as the notebook. 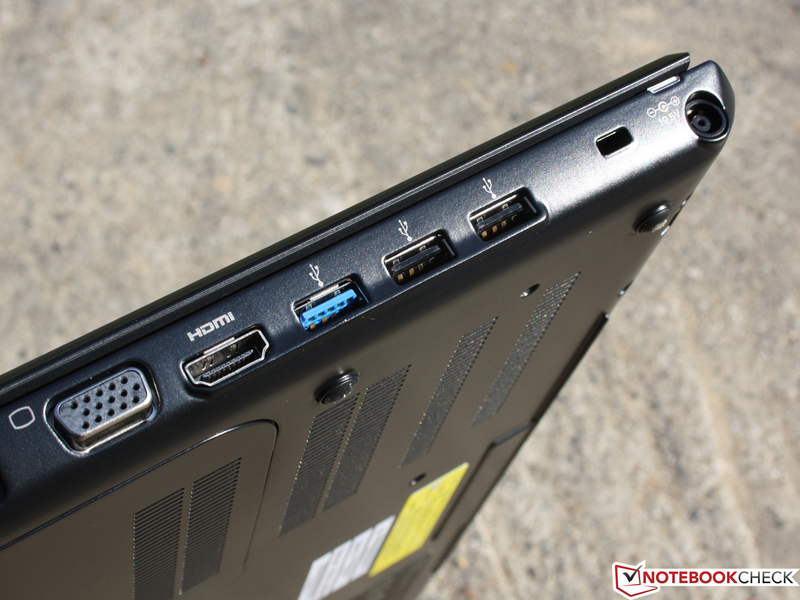 In addition to HDMI, VGA and 2 RJ45 (LAN), it supplies four USB ports. 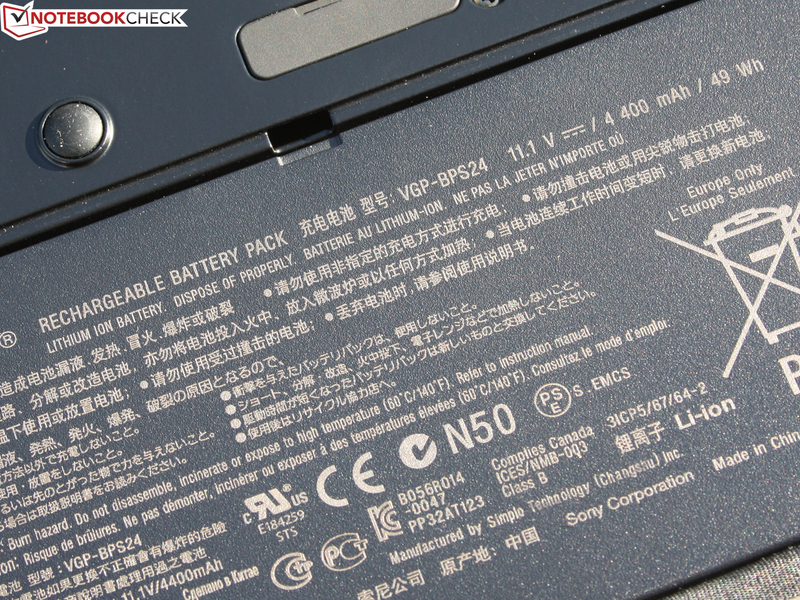 The battery slice, VGP-BPSC29 (lithium polymer) costs about 150€ and is connected on the case bottom. Both modules are identical to the docking and battery slice for the SB series (13.3 inch) in both looks and technologies. The manufacturer's warranty is 24 months. An service pack for an onsite repair, VGPE-VPPL/3, with a validity of three years, can also be purchased (270€). The keys are spaced with a gap of nearly four millimeters. The layout exploits the available width generously and has a complete numpad (four rows) with standard sized keys. "Enter", "Shift" and "Backspace" have the same size as on an external keyboard. The work surface is a homogeneous area, whereby the keys are in a small hollow. The keys' pressure point is clear, but it can't develop its effect due to the short key drop. The keystroke is soft and very quiet. Regrettably, the stop gets spongy on the outer left, so above the optical drive. The reason for this is that the keys yield under the fingers. The keys don't have a conical curve for giving the fingers a better orientation. Nevertheless, we quickly and easily manage with a gentle typing style. The yielding above the DVD drive isn't noticed when typing with light pressure. The keyboard backlight is a good invention. 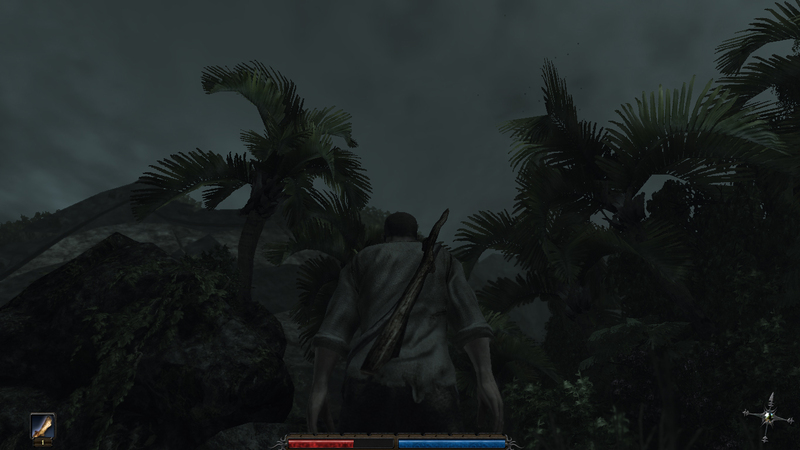 It can be controlled either automatically or manually via the brightness sensor located beside the graphics switch. Overall, the keyboard is good and the layout is almost perfect. The typing feedback however lags behind very good business keyboards. 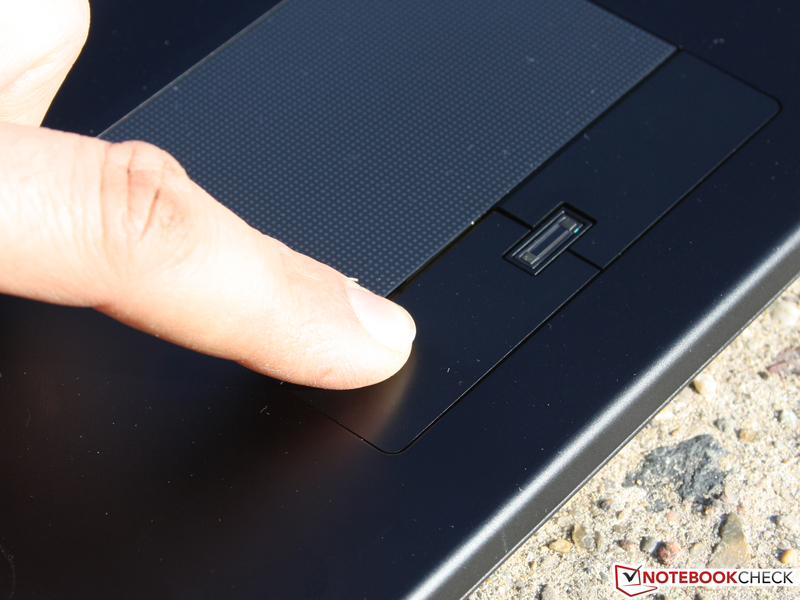 The touchpad has a diameter of 10.9 centimeters, whereby the entire field is sensitive for finger gestures. The matt surface allows the finger to glide easily without getting slippery. The square pattern on the pad can prevent chafed, glossy spots in the long term. 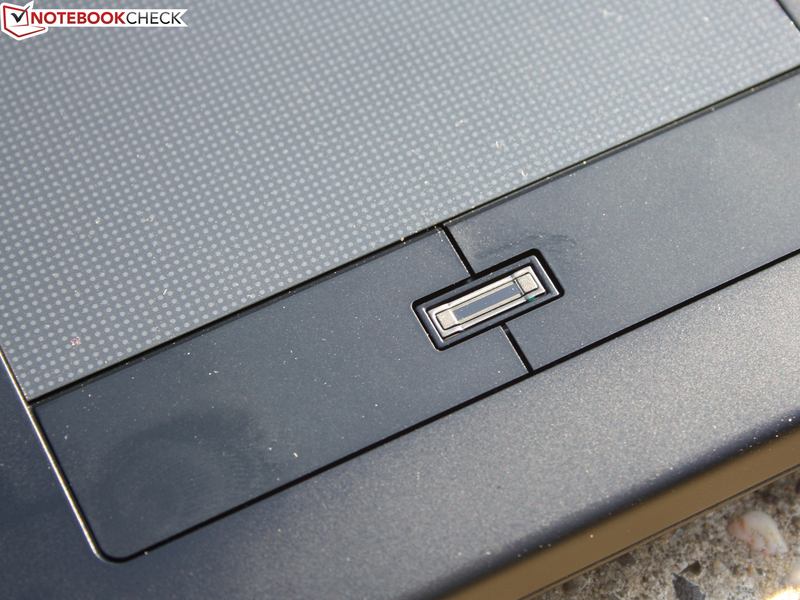 The Synaptics Touchpad 7.4 has horizontal and vertical scroll bars that aren't marked visibly. The broad keys click quietly, but need a fair amount of force for the short stroke. The pressure point sets in very late. The feedback when clicking fast is therefore poor. 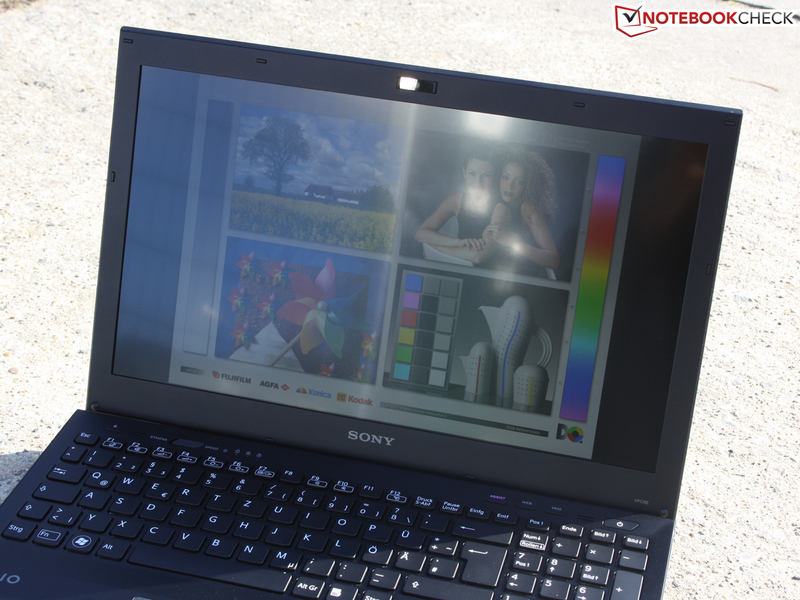 The Full HD screen in the Vaio SE has a high resolution of 1920x1080 pixels. 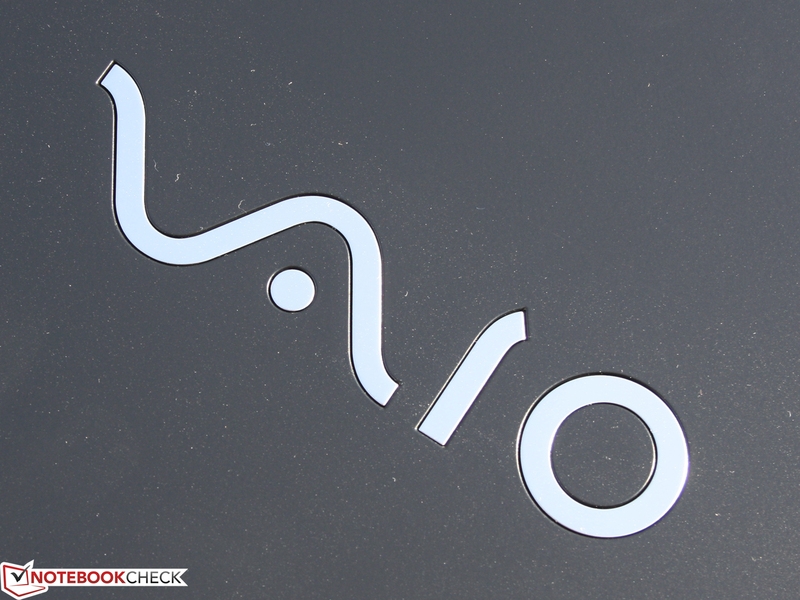 The VAIO plus screen (unknown model) is anti-reflective and thus users need not fear intense reflections. The non-glare screen is set up perfectly for a workplace notebook. It has high contrasts for brilliant colors in pictures, spreadsheets and texts. We measure a black value of 0.38 cd/m2 in maximum brightness. That is a good contrast of 697:1. Colors look crisp and fresh. The color spectrum, particularly important for professional users, however hashes high praise: The screen clearly fails sRGB. The screen has a surplus in the magenta range. 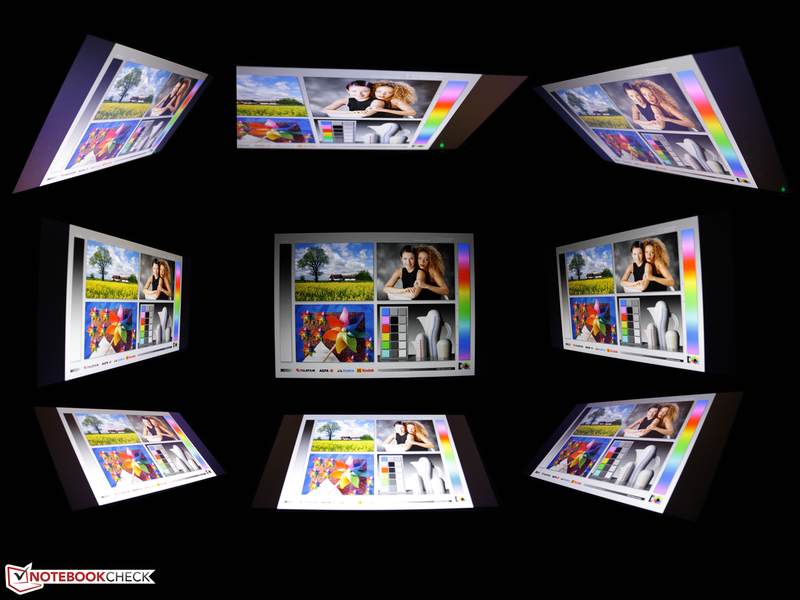 The color calibrator, i1Display, shows the following ICC profiles. We compare the TFT of the Vaio SE with that of the workstation, Dell Precision M6600 FHD (t) and the media machine, Vaio F22S1E/B FHD (t). The brightness doesn't have to be manually adjusted, but can be set automatically via the ambient light sensor. The screen varies its brightness according to the room's light condition. The brightness goes to maximum via sensor in sunlight. That is a good (average) of 253 cd/m2. We had disabled the ambient light sensor in the Vaio Control Center for the measurements. The illumination of 92 percent is very even. The brightest spot is 265 cd/m2 and the darkest is 243 cd/m2. The non-glare screen is the most important requirement for stress-free work in direct and indirect sunlight. 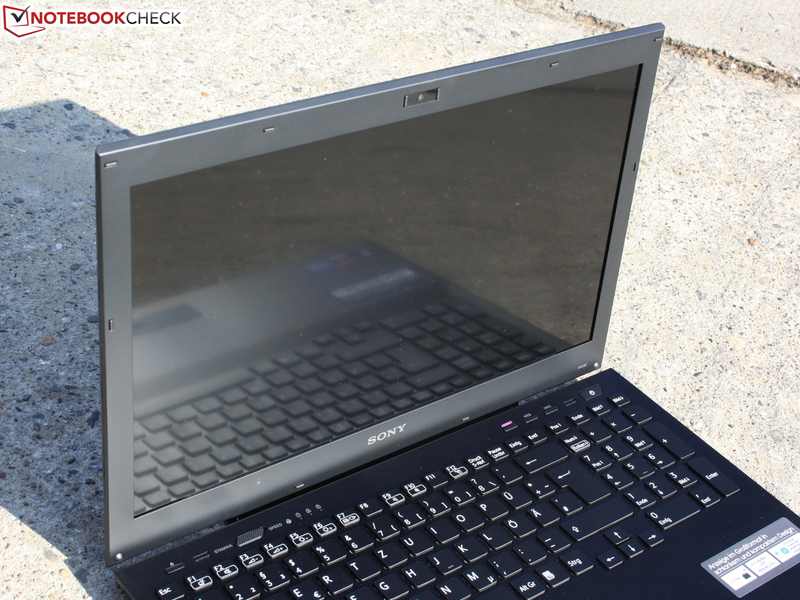 The matt Sony screen isn't as anti-reflective as other laptops. Thus reflections remain, but are strewn. The following pictures show the screen in sunlight. The brightness is sufficient for a clearly recognizable picture from a frontal and lateral view. However, we notice that the brightness is still not enough in unfavorable, direct incident sunlight. The Vaio SE will likely be better suitable for use in the sun than many other laptops with low brightness or glare screens. The Vaio Plus screen isn't a marvel in these terms and could be better with a higher brightness. The screen meets our high expectations set on viewing angles. 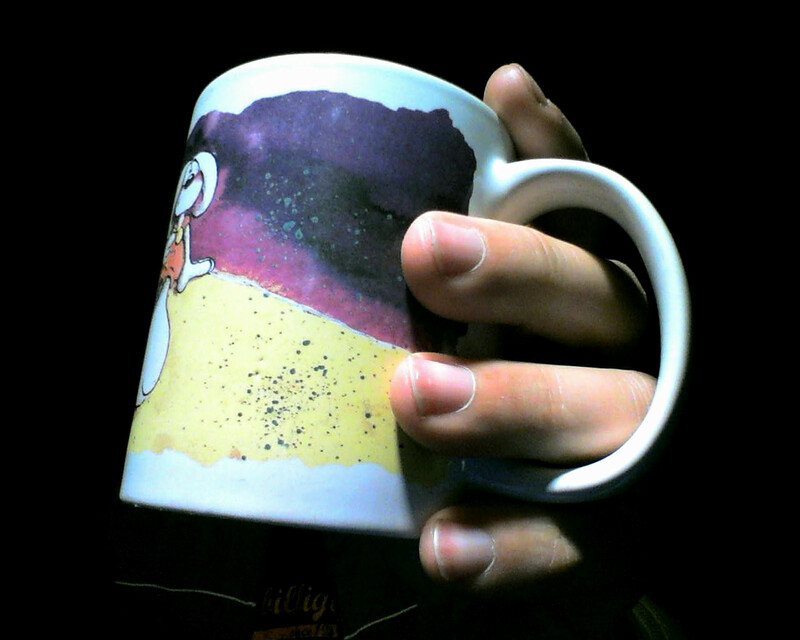 Ghosting doesn't develop (color inverting) when looking from the sides. Even views from the right or left at an 85 degree angle work without image distortions. The stability of colors on the vertical plane is impressive. 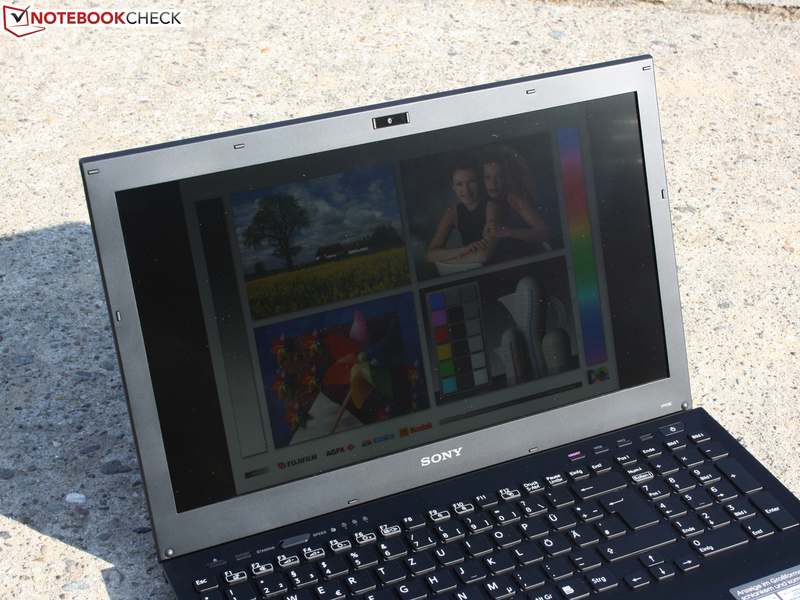 The shades of colors change at about 20 degrees, but there is no inverting like we've seen in so many laptops. The latter is also rare in high-end TFTs. The Intel Core i7-2640M (2x2.8 GHz) is still scarce on the market. It is the fastest dual core processor from the Sandy Bridge generation and can clock up to 3.5 GHz via Turbo 2.0 (overhead with good cooling). The DDR3 memory controller and an Intel HD Graphics 3000 are embedded in the processor. A dedicated AMD Radeon HD 6630M (1024 MB), which can be disabled via graphics switch (power mode Stamina/Speed) is also installed. Thus, users have the control over the active GPU. This array is supported by six gigabyte of DDR3 RAM. 4096 MB of that is soldered to the mainboard and 1x 2048 MB are inserted. The system can be equipped with a total capacity of 8 GB. Is the fastest i7 dual core worthwhile or does the less expensive Core i5 model, for less than 1000€, suffice? We first compare the single core computing speeds with Cinebench R10 Single 64 bit. It should be extremely strong due to Turbo 2.0, which can even boost the clock over the wattage of 3.5 GHz for a short period. An adequately dimensioned cooling system is a requirement for this. The i7-2640M (2.8-3.5 GHz) manages 5470 points when calculating on one core. That is only slightly more than the i5-2430M achieves in perfect conditions (4800; Sony Vaio VPC-EH1S1E). The 2620M, the predecessor CPU (2.7 GHz), which is found in many subnotebooks, manages 5479 points at best (good cooling system, e.g. 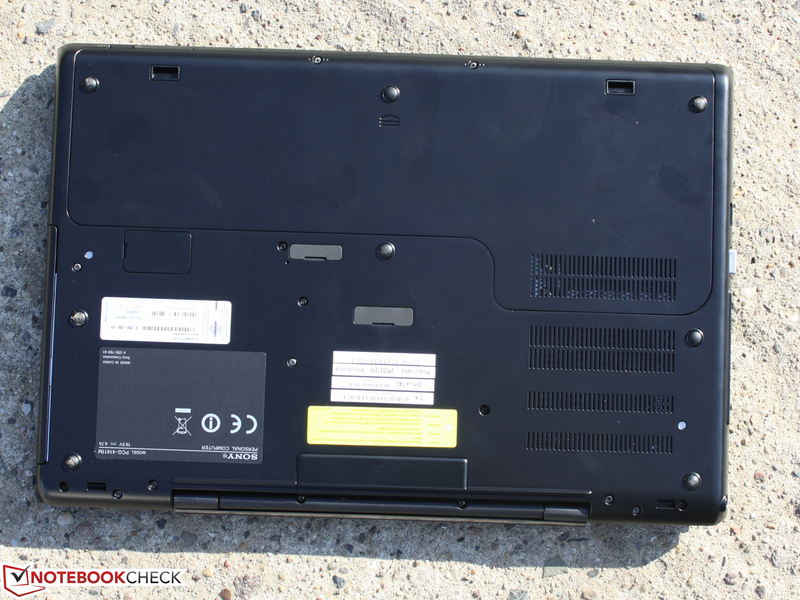 LifeBook S751). The predecessor CPU has the same score? Since the 2640M in the Schenker XMG P701 PRO manages a better 5642 points, both results indicate an inferior cooling system. The result looks different when all cores are processing (closer to reality). The i7 2640 reaps in 3.13 points in Cinebench R11.5 64 bit. That is more than the i5-2540M (also 4 threads) with 2.67 points (Samsung Chronos 700Z5A-S01DE). The suspicion of a poor cooling system isn't confirmed: The Schenker XMG P701 PRO with a 2640M achieves an almost equal 3.17 points. We could rule out throttling in case of sole CPU load in another test (following three screenshots): The processor stress test, Prime95 (multi core), starts with 3.3 GHz only to stay at a steady 3.1 GHz after about two minutes. Only when graphics load is added at the same time, in this case with Furmark, a throttling to 2.9 GHz to 800 MHz can be provoked every ten seconds. As soon as the graphics load is closed, the clock again rises to a stable 3.1 to 3.3 GHz immediately. In short, the difference in processing speed of the i5 and the i7 dual core configuration is measurable, but low. Users who need higher multi core computing power (e.g. video rendering, image processing) should prefer an i7. CPU throttling only is shown in an (unrealistic) scenario with simultaneous GPU stress. Sony should have invested in an SSD (instead of HDD) rather than in a Core i7. The experienced work speed as well as the total score in PCMark Vantage would have increased considerably with that. The system performance test finishes with 7720 points. That isn't a bad score, but devices equipped with an SSD, such as the LifeBook S751, easily reach 12383 points and don't even have a dedicated graphics card. 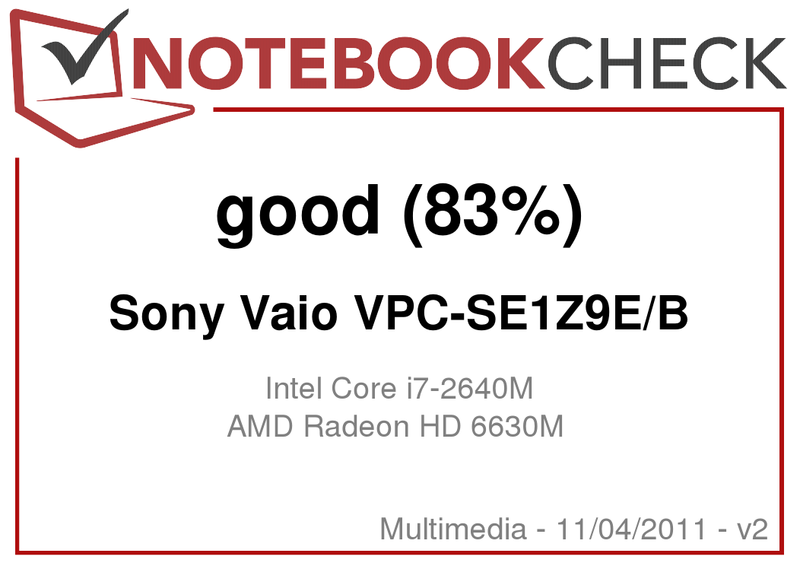 We could estimate the Vantage score of the Vaio SE i5 version (2430M, 5400 rpm HDD, HD 6630M) on the basis of the Samsung Chronos 700Z5A-S01DE (7200 rpm HDD, otherwise HD 6750M). The latter manages 7118 points, which doesn't avow the VAIO SE i7 version to have a big performance benefit. The DirectX-11 benchmarks, such as Unigine Heaven 2.1 (11 fps), certify the AMD Radeon HD 6630M a performance similar to the old HD 5650 or a GT 525M (12 fps). The currently popular GT 540M (13 fps) in low priced consumer devices is only a touch faster. The result is identical with all previous HD 6630Ms. 3DMark11 (P 1050) runs a bit weaker with the GT 540M (P ~950 points). 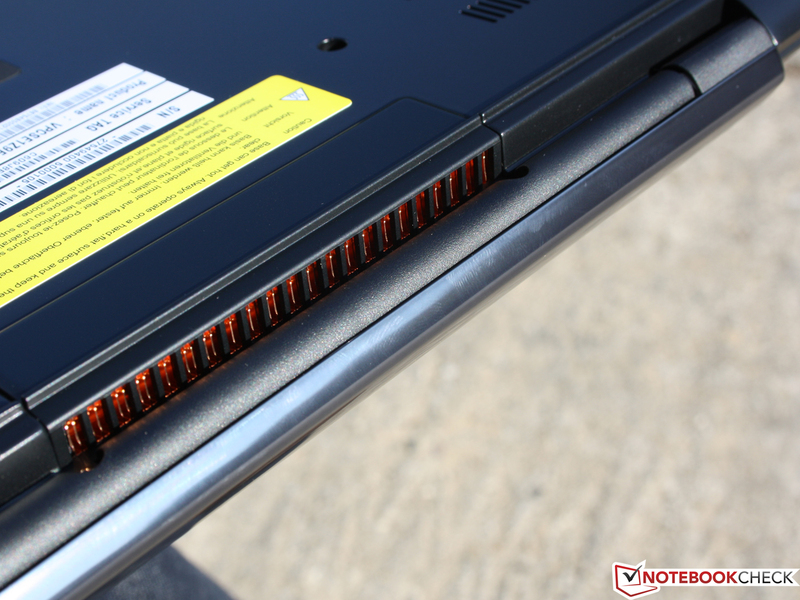 The Dell Vostro 3550 with a 2620M manages 990 points and is thus almost on a par. A HD 6770M (~1500) or a GT 555M (~1300) would be necessary for more points and consequently higher gaming power. The classic 3DMark 2006 (1280x1024) finishes with 7069 points on the Radeon, which is slightly below a GT 540M (~8000 @ XMG A501 with 2620M). The best score with a HD 6630M was 7510 points in the Dell Vostro 3550 (2620M). The HDD sub score in PCMark Vantage is 3654 points, which is a slightly above average score for a 5400 rpm HDD. First 7200 rpm hard disks can also reach 4000 points. Behind the score, a sobering read rate of 68 MB/s, respectively 87 MB/s (HDTune/CrystalDiskMark 3.0) are found behind the score. SSDs boost the above score to 20 - 25 thousand points. That could have increased the system score in a few partial ratings significantly. An SSD with at least 128 GB would have been justified for a laptop price of 1500€. Sony could have omitted the Core i7 for this. 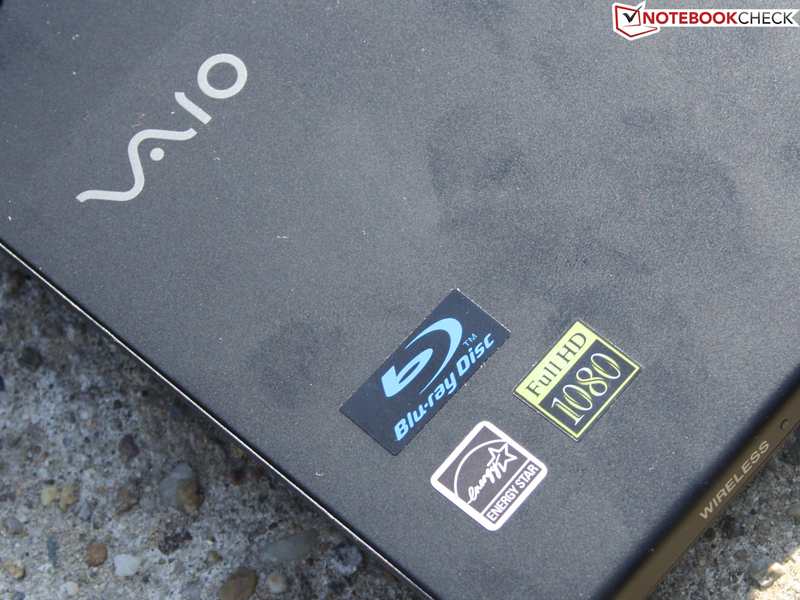 Users who want a speedy Vaio will buy the SE i5 version for less than 1000 and built in an SSD. The green-red fps chart with our four test games of the past years is unambiguous. 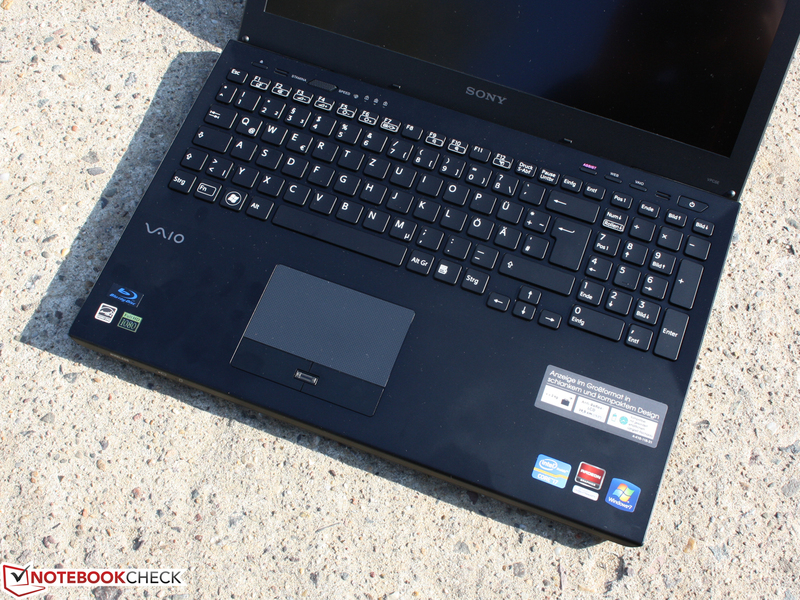 The Vaio SE with a Radeon HD 6330M is just still suitable for current or younger games. However, the avid gamer shouldn't consider the native resolution of 1920x1080 pixels. The gaming performance is at its limits of smooth playability with 1366x768 pixels in high details. The Vaio SE delivers a mixed show in regard to noise: In idle (Stamina), the 15 inch laptop always remains unobtrusively audible, whereby the HDD's basic noise is in line with the fan's quiet whir. The fan is never off. In order to hear this quiet 31.4 dB (A) we have to listen very closely. Occasional load when surfing or typing lets the level gently increase to 31.7 dB (A). Modifying the power mode doesn't change anything about the very good idle behavior. When the processor and/or Radeon graphics (Speed mode) work hard, the 15.5 inch notebook gets a lot louder. The high-pitched noise reaches a level of 40 dB (A) quite fast (3DMark Vantage, Cinebench R11.5). This is the tolerable noise level that users will have to expect during normal use (games, CPU load, etc.). We measure 46 to 50 dB (A) in the stress test (CPU & GPU). The fan alters its speed between these levels in intervals of ten seconds. The stress test is however a sooner unrealistic scenario. Since the fan is always active, waste heat can't accumulate in the case and the surfaces stay within the blue range (idle). Although the fan is noisy during maximum stress over several hours, the temperatures increase considerably. We measure 52 degrees in the center, in the area of the air outlet, and even 56 degrees to its right. However, this is only a selective rate. The average is 40 degrees. 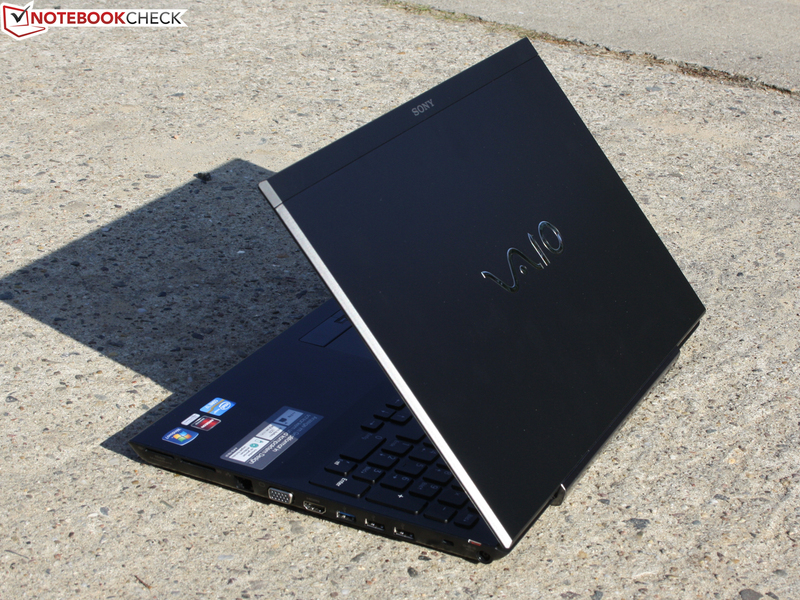 The Vaio SE with a Core i7 remained stable in the multi-hour stress test. However, the extremely varying power consumption (power adapter) caught our attention and made us curious. The CPU quickly throttled its clock to 2.9 to 800 MHZ (10 second intervals) at simultaneous graphics load (Furmark & Prime95, all cores) but always recovers to 3.1 GHz. According to that, the temperatures seem only very minutely overtaxed in this stress situation. Turbo usually takes effect with 3.1 GHz without simultaneous GPU load. No matter if Prime95, WPrime, SuperPi or Cinebench Multi/Single: The dual core i7 always supplies the usual Turbo power. The thermally controlled throttling is a feature of Turbo Boost processors. The clock is reduced step-by-step when specified temperature limits are reached. The Vaio test device's idle power requirement is between 10.4 watts (energy saving, minimum brightness, wifi off) and 25.2 watts (high performance, maximum brightness, wifi on). Especially the maximum measurement is surprising. Such rates aren't typical even for 45 watt Intel quad core laptops nowadays (e.g. i7-2630QM, Gigabyte P2532N, 12-19 watts). The battery was fully charged. The Vaio SE1 54 62 consumes up to 87 watts in the stress test (CPU+GPU 100%) when the clock quickly changes due to the temperature (clocks: 800 MHz, 2.9 GHz, 3.1 GHz). Prime95 (CPU load only) needs 74 watts for itself (no throttling). Furmark (GPU load only) treats itself to 61 watts. 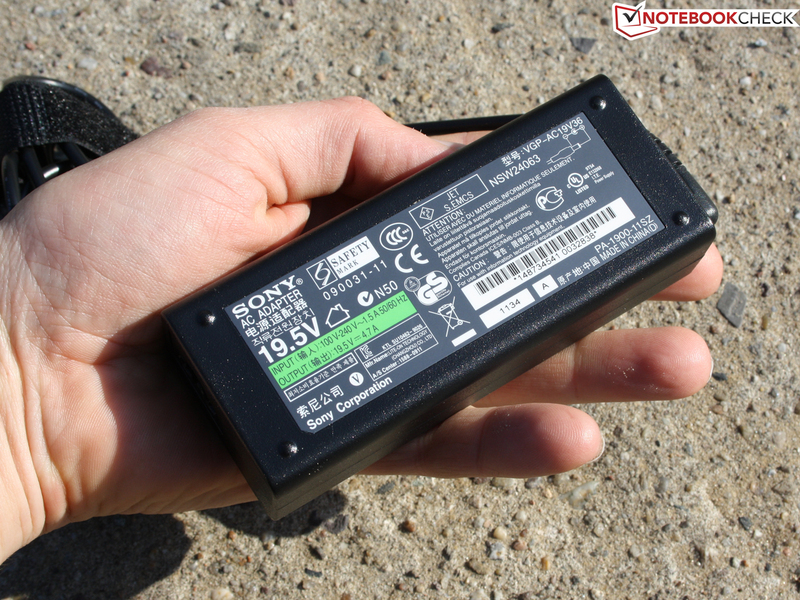 The Vaio SE1 with a Core i7 thus definitely needs the 90 watt power adapter (323 grams). The 15.5 inch device with its 49 watt hour lithium polymer battery (4400 mAh) is disappointing in battery life. It's only enough for 2:40 hours when surfing on the Internet (via WLAN). 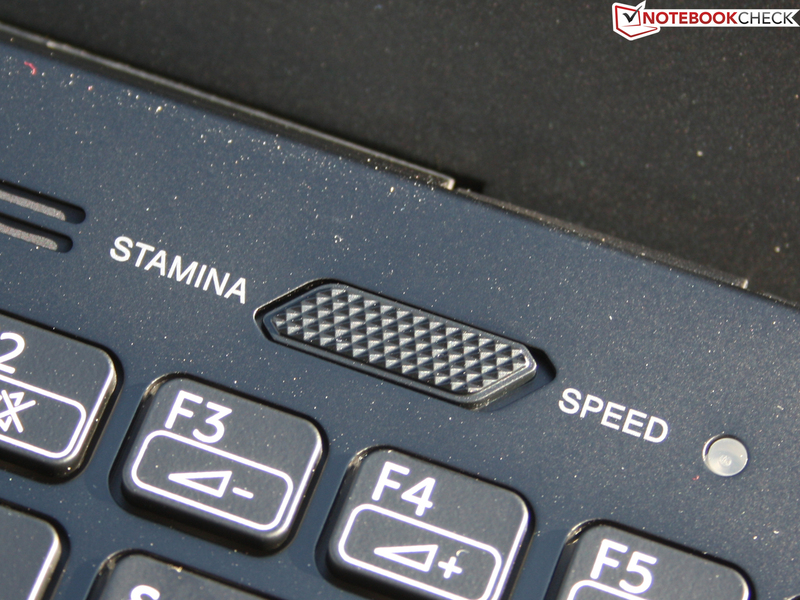 The battery life was measured in Stamina mode (Intel HD 3000) with a brightness of roughly 100 cd/m2. 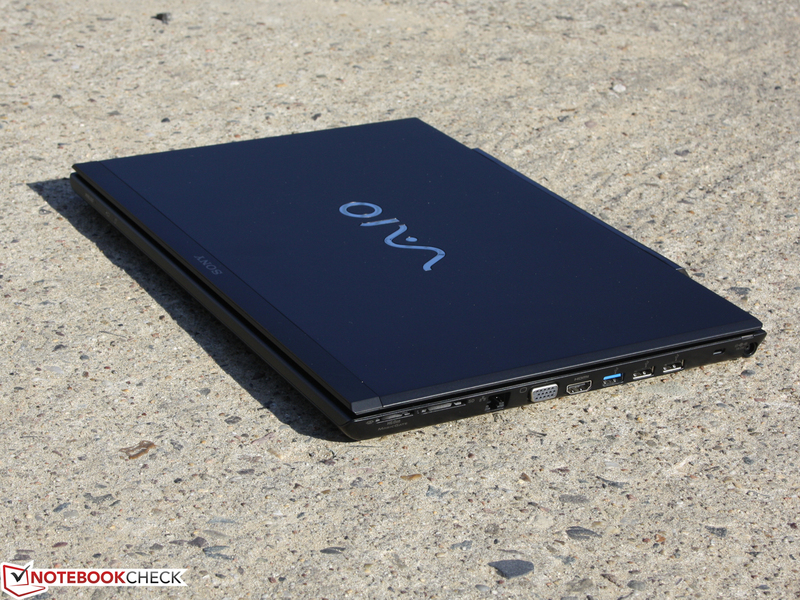 The Vaio SE can last for a lot longer with lowest brightness, wifi modules off and idle. The Reader's Test first finished after 5:35 hours. It is 3:20 hours with a Blu-Ray movie. 2:38 hours pass before the next session can start again (charge time). Due to the low wifi runtime, mobile users, who would otherwise be attracted to the Vaio SE, are forced to purchase the battery slice. See docking station & battery slice Sony Vaio SA and SB for a review of these accessories in the smaller Vaio SB (13.3 inch). All that glitters is not gold. Nevertheless: Hopes of a balanced combination of professional work device and entertainment suitable consumer have basically been met. Sony builds in the contrast and viewing angle strong Full HD screen that many have been waiting for. Adept laptop users know that such a high-end screen isn't a matter of course in a market that bargains for the best price when buying components. The second core issue is the system noise. It has improved and the user only has to live with a tolerable maximum of 40 dB (A) during normal load. On the other hand, the waste heat has unfortunately climbed and tops the Vaio SB 13.3 inch laptop by almost 10 degrees (bottom up to 56 degrees). Where the 13.3 inch notebook of the Vaio SB series still offered four to five hours of battery life, the 15.5 inch Vaio SE blunders: 2:40 hours don't knock anyone's socks off nowadays and aren't enough for this price range. 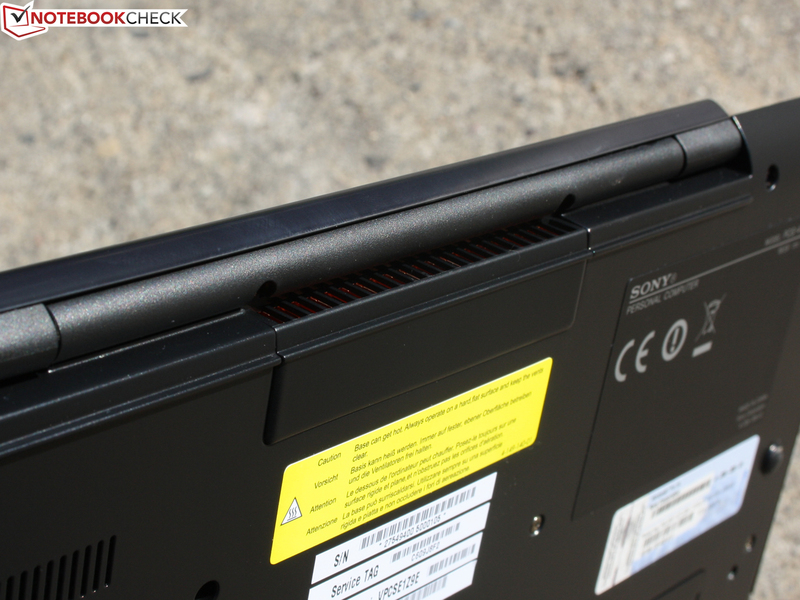 The optional battery slice can lessen this shortcoming, but it costs extra and makes the laptop heavier. The input devices are upper midrange and can't achieve the perfection of a HP EliteBook or Dell Latitude. Here, the feedback is too weak and there, the touchpad keys have a too short stroke. On the other hand, the layout is very spacious and it has a keyboard light. 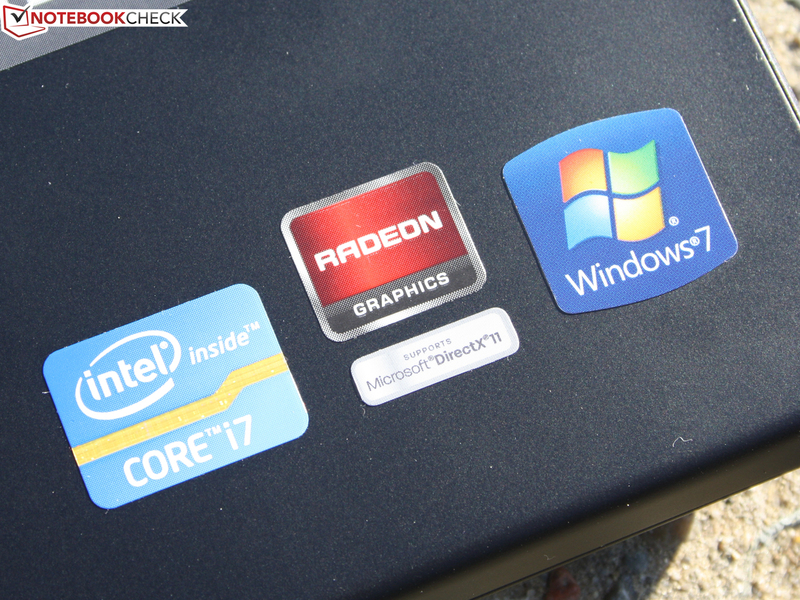 The new dual Core i7-2640M (2.80 GHz) isn't easily surpassed in performance. Together with the gaming suitable AMD Radeon HD 6630M, users are well equipped for the next few years. There is no explanation why Sony cuts back on RAM and installs an odd number of 4 + 2 GB at a laptop price of over 1500€. 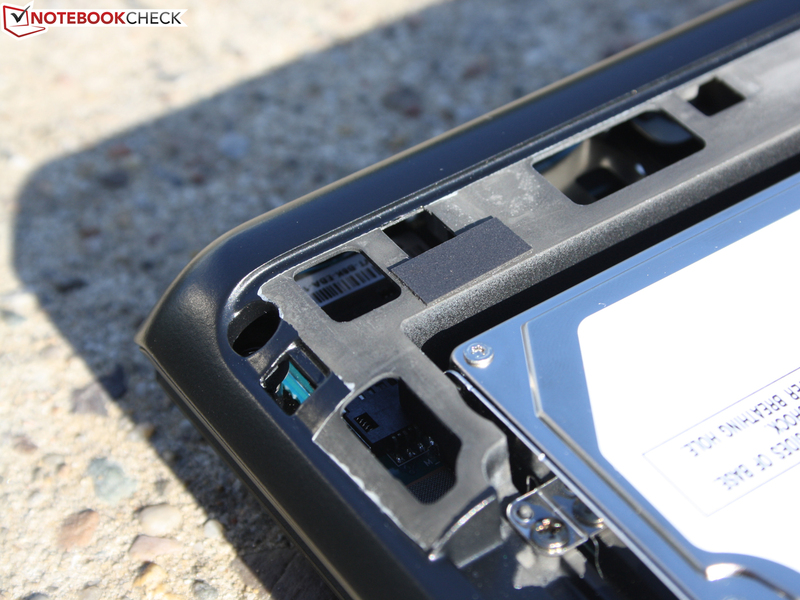 Fans of performance and silence will miss an SSD. Even a model for a bit more than 100€ would have increased the system performance greatly and also eliminated the quiet HDD clacking. All and all, we can ascertain that the weak points in the SB series (TFT, system noise) have been eliminated or, in other words, the SE series hasn't inherited them. In return, the battery life and waste heat have deteriorated. The pros and cons are evened out and the rating "Good" remains unchanged in the end. 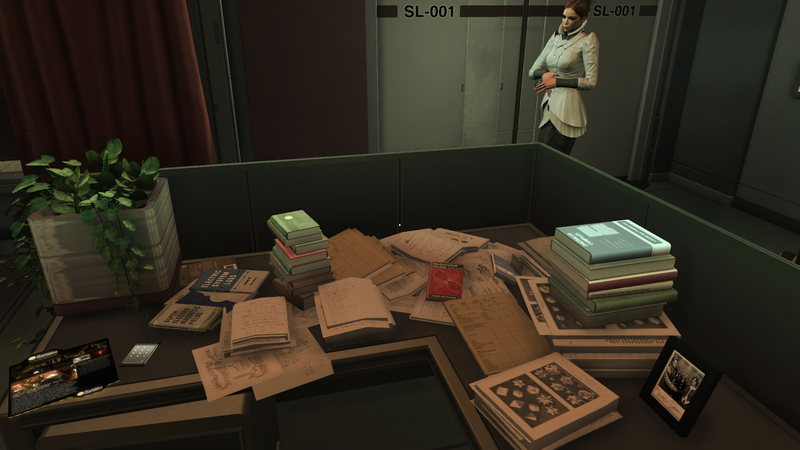 Although we did it in this case: A comparison between the SB and SE range is only possible to an extent due to the classification of subnotebook, respectively multimedia. Buyers who value a very good Full HD TFT should take a closer look at the Vaio SE series. The entry level model, Vaio VPC-SE1E1E (silver rather than black) with a Core i5 and without 3G/Blu-Ray is available for just under 1000€. The same Full HD screen (VAIO Plus display) is also part of this version. 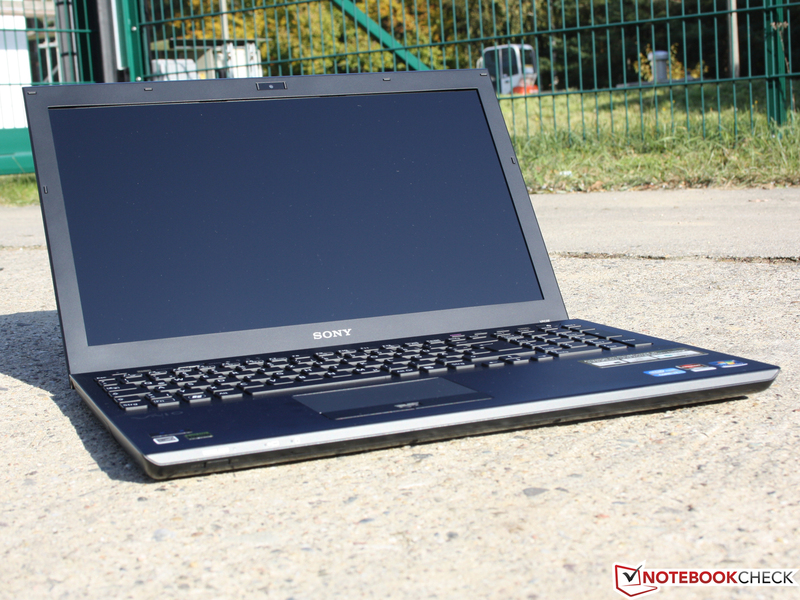 Sony Vaio VPC-SE1Z9E/B: Stamina mode or not, almost three hours with the internal battery is too little in this premium price range. The Vaio VPC-SE1Z9E/B in 15.5 inches is the logical completion to the 13.3 inch Vaio SB1V9E/B. The exhaust air is conducted to the outside behind the hinge, alike the SB model. This caused particularly hot surroundings in the stress test (up to 53 degrees Celsius). 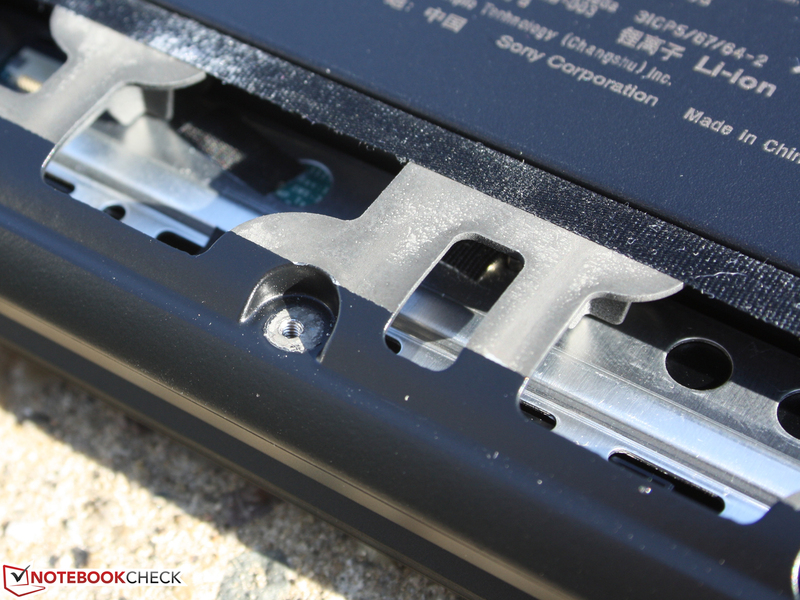 The battery is found beneath the maintenance cover and can be removed easily. With a capacity of 49 watt hours, it is enough for a real runtime of almost three hours. This calls for a battery slice (long life slim battery) that is connected under the base plate. The RAM can't be removed completely, 4 GB are on board (2 GB are inserted). 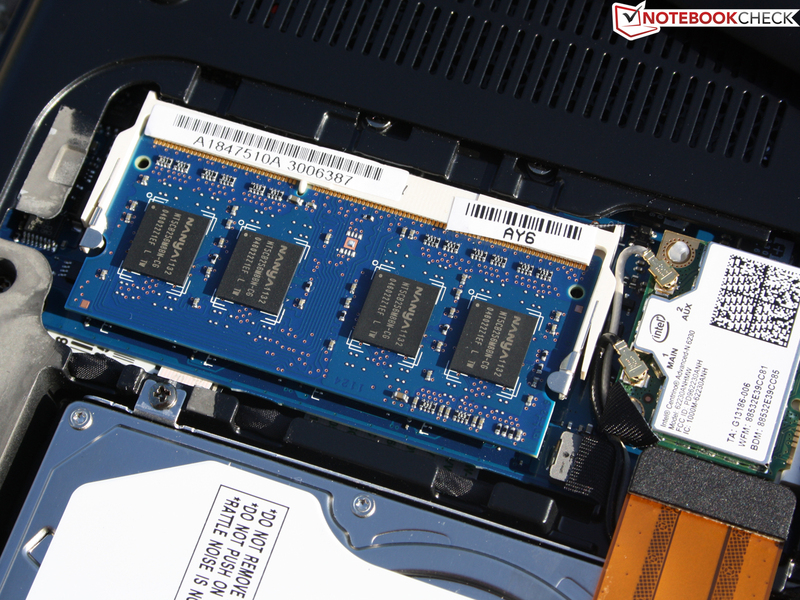 The 750 GB Toshiba hard disk can be upgraded by an SSD easily. with HDMI, VGA, (1) USB 3.0 and (2) USB 2.0. Users on the go can quickly disable all wifi modules incl. HSDPA modem with this switch. The 90 watt adapter weighs 323 grams and is fairly compact for its capacity. This is just enough for the maximum power consumption of 83 watts. 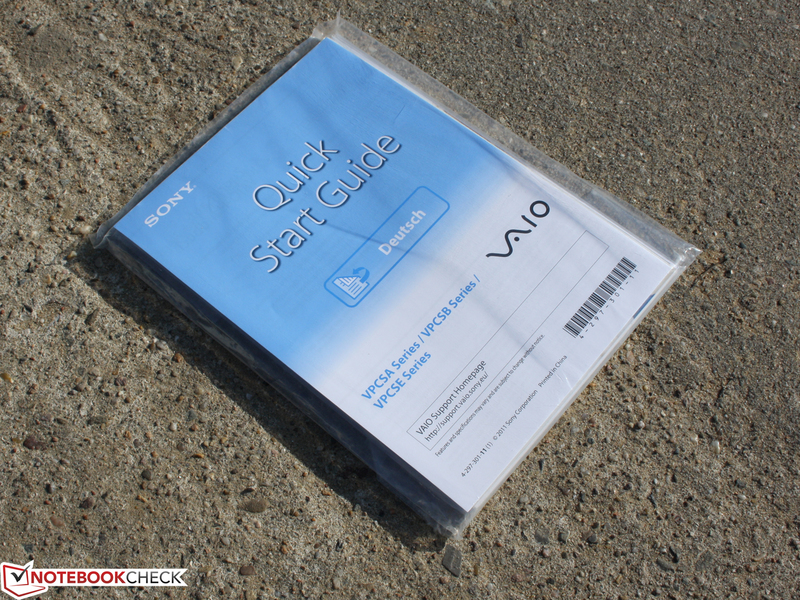 The accessories in the box are limited to this quick start guide. The user has to create recovery data carriers. 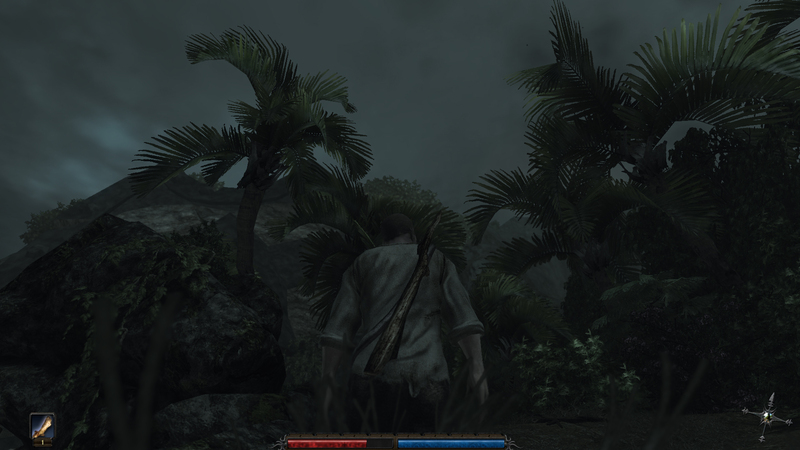 Users can manually disable the dedicated graphics here (operating mode). 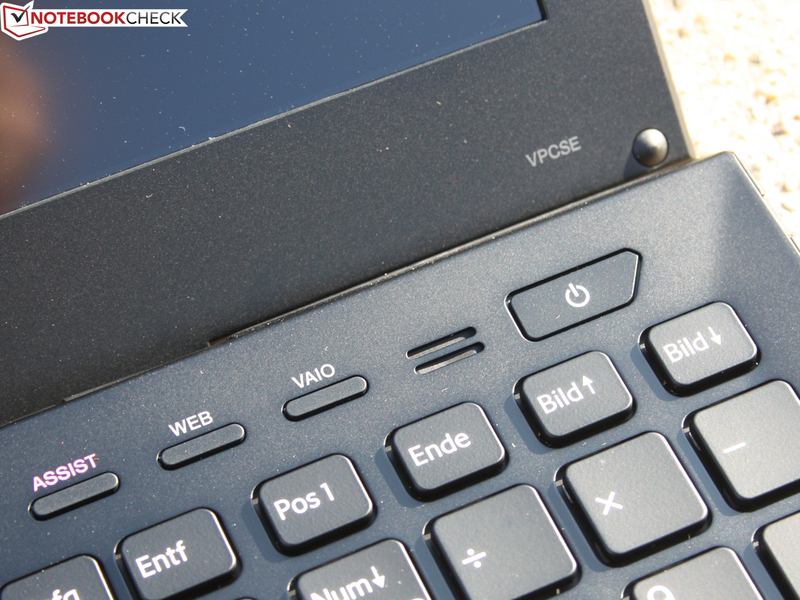 We naturally took the 1530€ deluxe model as the test device. The smaller SB range was launched onto the market in the spring of 2011 as a consumer suitable business device. 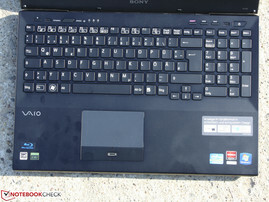 The 15.5 inch device, debuted at the IFA 2011, has inherited all the above qualities. Even the looks and the materials have been copied to 100% from the SB 13.3 inch devices. but unfortunately only has a sufficient torsional stiffness. The material is thin and has been reinforced with many crosspieces for stability. That is beneficial for the bottom that can't be evidently dented anywhere. As to the technical configurations, there is the high-end version with a Core i7-2640M, Blu-Ray reader, a 6 GB RAM and UMTS module. The Core i5-2430M version is a lot less expensive with a 4 GB RAM, conventional DVD burner and without UMTS: a bit less than 1000€. 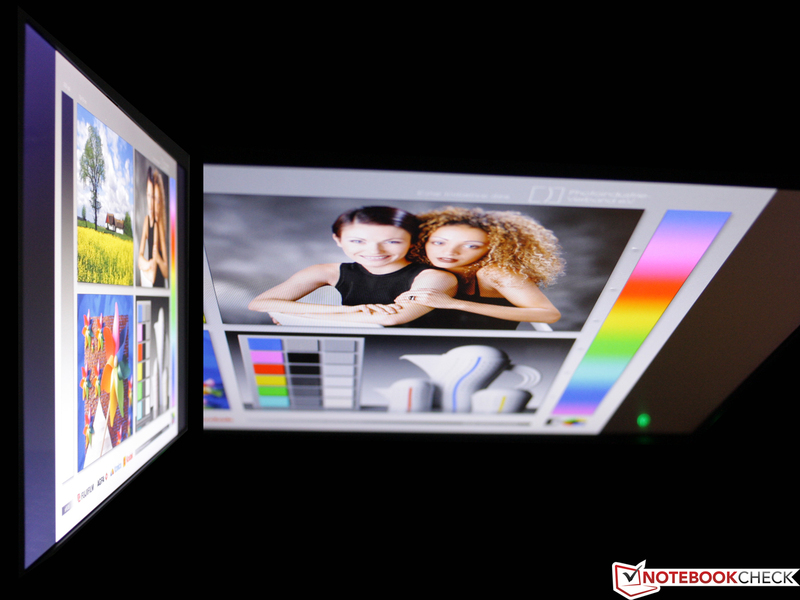 Praiseworthy: The matt, viewing angle strong WUXGA TFT (1920x1080) is standard. 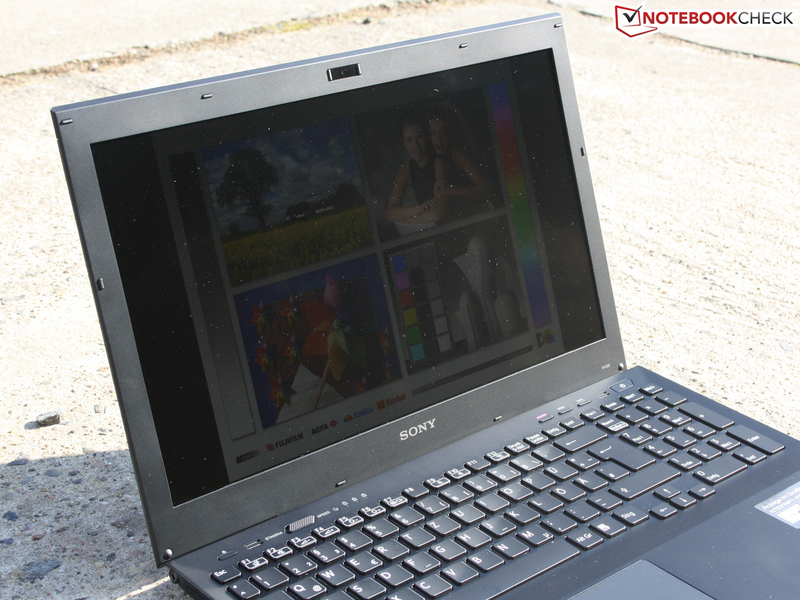 Sony Vaio VPC-SE1Z9E/B: The Full HD screen's viewing angles are first rate. A great screen for working inside and out. All professional options are available: A battery slice and docking station can be bought additionally. The short battery life of this 3G model isn't acceptable for mobile workers. Feedback strong keys would have been perfect. One deficiency is eliminated (TFT), another is created (battery life).